On Osun: Is Dagunro Really That Different from Tete? Yoruba people, in song and proverb, like to make much of the difference between tete – an amenable to the palate type of vegetable that’s easy to eat – and dagunro – a coarse type of vegetable that carries thorns on its stems. The warning goes that you shouldn’t be so silly as to eat dagunro the same way you eat tete or you’ll have yourself to blame. In the video, Ogbeni and his supporters are issuing the explicit warning, presumably to the PDP, that dagunro (Osun) should not be eaten the way tete (Ekiti) was eaten. In the end, they were proved right with Ogbeni’s rearguard action to win re-election. But what can the APC learn from this victory? The APC’s model of winning elections is clearly unsustainable. Nuhu Ribadu defeated GEJ there by 60-40 in the 2011 Presidential election. The APC (then ACN) swept all the State House of Assembly, Senate and House of Reps seats in the same general elections of 2011. If you know a fiercer campaigner in Nigeria today than Rauf Aregbesola, please point them out to me. As much as he may have had some misguided policies in his 4 years in office, he definitely got many things right. Osun state is almost certainly the APC’s strongest state in Nigeria. A friend who was part of a ‘fact finding delegation’ from Oyo state to one of Ogbeni’s campaigns said they were incredibly inspired just by watching him, especially after he rode on top of a bus for 20 kilometres (I did not see a single photo of him inside a bus during the campaign, he was always on top of it). All of that went into beating an ex-jailbird who will probably go to his grave with the smell of a high-profile murder never departing from him. I quibble with the votes he racked up in Ife which flattered his final result, but leave that aside – he was beaten 57-43. What if Aregbesola didn’t campaign as hard as he did? It’s a real warning that if any of those perfectly lined ducks had moved, the state could have been lost. This is still not being used enough. For a party that is seeking to overturn an established order, it really has no choice but to do this. Over at the FTF we did some very simple stuff on the day of the election (more on this later) and the response was quite interesting. Of course if this played any role in the election result, it could not have been more than 0.0001%. The work had already been done by then. Still, there are plenty of low hanging fruits to be plucked. But it cannot be a scatter gun approach. The battle now moves to Adamawa. I am a Man United fan and I know what it feels like to go through a terribly predictable season punctuated with the occasional false high of beating Arsenal 1-0 at Old Trafford. Enough said. The man seems to be assembling what is clearly some kind of Bourdillon-free coalition that is tested and trusted to deliver elections if only in Osun state. But then everyone needs a strong base from which to launch a bigger ambition. He convinced Serubawon (Isiaka Adeleke) – which turned out to be a very good move and ‘Prince of Peace’ (Olagunsoye Oyinlola) – which turned out to be a waste of time – to join him from the PDP. I doubt these people came over because of Bourdillon but it will be a test of his own clout to see how he manages these very inflated egos. Staying with defections and as an aside – do we overrate defections in our democracy at the expense of loyalty? There are plenty of people in the PDP and APC who have remained loyal inside the party even after not getting what they want. There are many who will never defect to another party no matter. Yet, people who cross carpet dominate discussions about our ‘nascent’ democracy which in turn increases cynicism among voters who feel they are all the same anyway. Cynicism when dealing with politicians is always recommended but as with everything, moderation should be the watchword. By signalling to politicians that bad behaviour is expected of them and not raising the status of those who remain loyal enough, we are lowering the cost of the very thing we hate. If you let a politician know that you expect bad behaviour from him, he will ‘deliver’. I don’t have data but how much does defection pay anyway? Would be nice to compare the number of elections won by politicians immediately after defecting to a new party with those of all others. The most high-profile one I can think of was Isa Yuguda in Bauch in 2007 who lost his party’s ticket, crossed over to another party, won the election and then crossed back to the PDP. But many people who do so regularly lose both ways, most notably an Ondo Senator who was part of 3 parties in the run up to the 2011 general election, losing 2 primaries and one general election in the process. Given all these what are we to make of the much hyped difference between dagunro and tete? I think that, like many other Yoruba proverbs, the distinction needs to be updated for a modern reality. Indeed we live in a time of genetically modified foods being as mainstream as mainstream can be. A motivated scientist will not take too long to modify dagunro so it grows without thorns. And then what? It will be eaten like tete very easily, catching those who were relying on the status quo never changing, badly off guard. A few years ago, the thought of self driving cars would have been laughed out of the room, but here we are today. Assumptions are there for the taking for those who rely too much on them. Ogbeni Rauf Aregbesola deserves all the commendation he can get for coming out on top in this battle but for the APC as a whole, there is no rest. There is so much work to be done by the party which faces a mortal danger of being annihilated in next year’s general elections, giving the PDP an implausible bigger vote share than it has now. A useful opposition party is such a critical part of the democratic furniture that we cant afford to have a hopelessly weak one. This is why some countries pay parties with tax payers money to oppose the government elected and funded by taxpayers. Here in the UK as an example, Her Majesty’s Leader of The Opposition, gets a salary rise from roughly £65k to £140k when h/she’s elected opposition leader to bring him/her in line with the Prime Minister. A big shout out to all those who made the victory possible, but the work is still very plenty. Given that when it comes to government revenues, we are an oil based economy, what kind of times do we live in? The numbers suggest we are in an economic boom, regardless of what the reality ‘on ground’ might be. The dates I used are from May 29th, 1999 to May 28th, 2003. 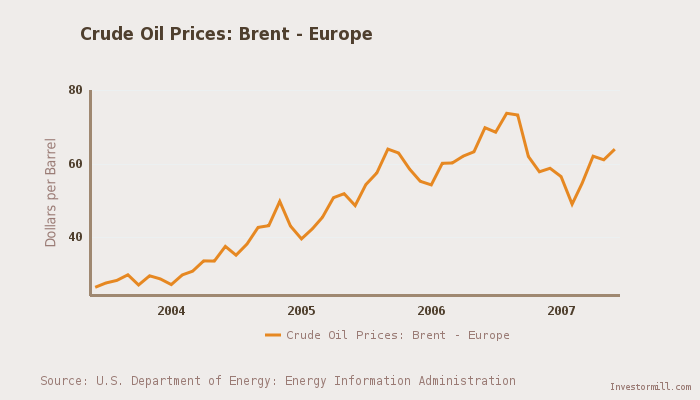 In June ’99, oil prices touched $15.86 while the highest point was September 2000 when prices hit $33.15. As is evident from the chart, prices fluctuated quite a lot in those 4 years – indeed the high and low points happened within almost a year of each other. 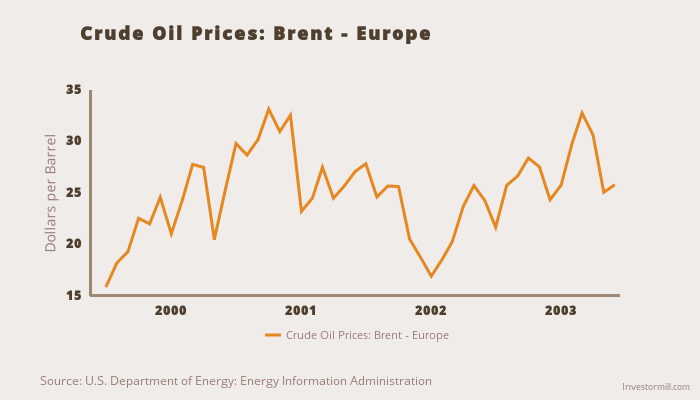 Think of it another way – oil prices closed at $21 at the end of 1999 so if legislators were going to budget based on that for 2000, it would have been a bit of a mess because within 5 months (May ’00) prices had dropped below that high point. Perhaps this uncertainty is what caused that government to save money like it did and not really spend on big infrastructure projects. The dates used here are from May 6th, 2010 when GEJ officially took over and July 31st, 2014. 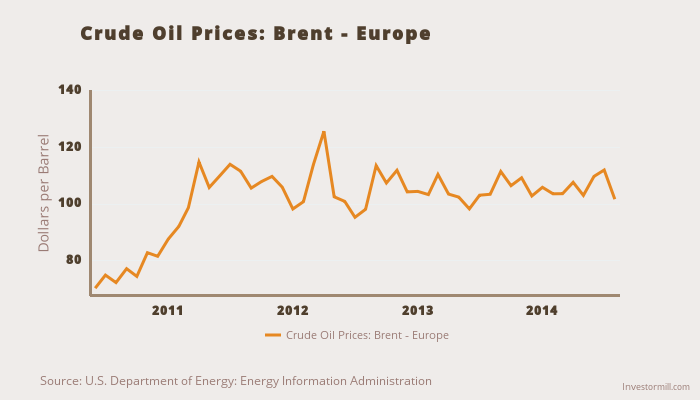 The lowest point of the period was in that same May when prices were $70 per barrel i.e. since GEJ came to office, prices have never been lower than he met them. The high point was in March 2012 when they hit $125. Other than that, from the graph you can see that prices have been fairly consistent around the $100/barrel mark. Can you guess what that sharp rise in 1990 one is? (Hint: Pius Okigbo report). 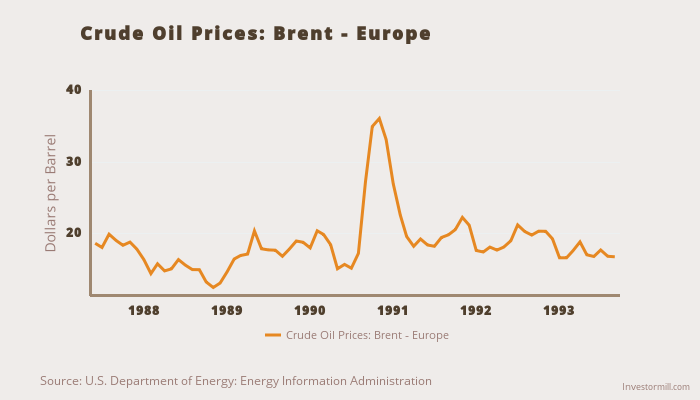 In October 1988, oil prices hit a low of $12 and in October 1990, they hit a high of $36. The direction of travel is unmistakable – the lowest point of $26 was in May 2003 and the highest point was in July 2006 at $74. 1. Can you name any major project being carried out by this government that is not being funded by a loan or grant? From 2nd Niger Bridge to all the various airports being built. This is a genuine question as I am sure there are some big projects funded with oil revenues but which aren’t so obvious. I tried to use a FoI request to work out how much foreign aid and loans were being used to fund the budget but so far there’s been no response. 2. In March 2011, GEJ signed the new minimum wage of N18,000 per month into law, up from N11,000 per month. What is often not understood is that organised labour got the government to maintain the difference between the bands after the new minimum wage came into effect. The effect of this was to almost double all salaries. This partly explains why the Finance Minister was complaining recently that the FG’s wage bill had risen from N857bn in 2009 to N1.8trn this year – the bulk of that increase would have happened post the new minimum wage. She says the wage bill is for 1.2 million workers but the workers themselves say there are only 870,000 of them in the work force. But note that they do not dispute the N1.8trn being spent only on who it is being spent on. Whatever the truth may be as to the actual number of workers – we are spending around 38% of the budget on less than 1% of the population. 3. Bear in mind that the planned budget deficit for this year is almost N1trn (it could be more, it could be less) and there was only one surplus month between May 2013 and June 2014 i.e. a month where the government spent less than it earned. 4. Given that the bulk of government’s revenues still come from oil revenues and its finances are at full pelt at the moment, what do you think might happen if oil prices were to fall to say, $75 for around 6 months? Or what if we cant sell as much crude as we normally would? Certainly not that far-fetched – it’s getting harder to sell our crude quickly on the international market (partly due to the Americans not buying as much as they used to). By the 3rd week of July, around one-third of the August cargoes remained unsold. As a business owner, will you be willing to pay more taxes to support the ‘Transformation Agenda’ if oil prices start to drop? Definitely worth thinking about. A couple of people have taken me to task about comparing 1999 – 2003 dollars with 2014 dollars without using a base year. So I have inflated the 1999 – 2003 numbers to 2014 dollars. For example, $1 in 1999 would be worth $1.42 today, $1 in 2000 would be worth $1.38 today and so on. Apologies for the dodgy looking chart but you get the gist – the low point of June 1999 which was $15.86 back then would be worth $23 today, around a quarter of current prices while the high point of September 2000 which was $33.15 back then would be worth $46 today, around half of today’s prices. In other words, comparing the first 4 years of both terms means that the current government is doubling the best revenues that the Obasanjo government ever managed.